Check out my other Patterns for Sale! 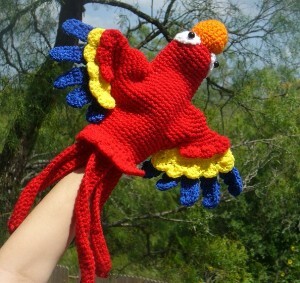 Bright, cheerful, and worked in bold primary colors, this Scarlet Macaw Hand Puppet will capture your imagination. 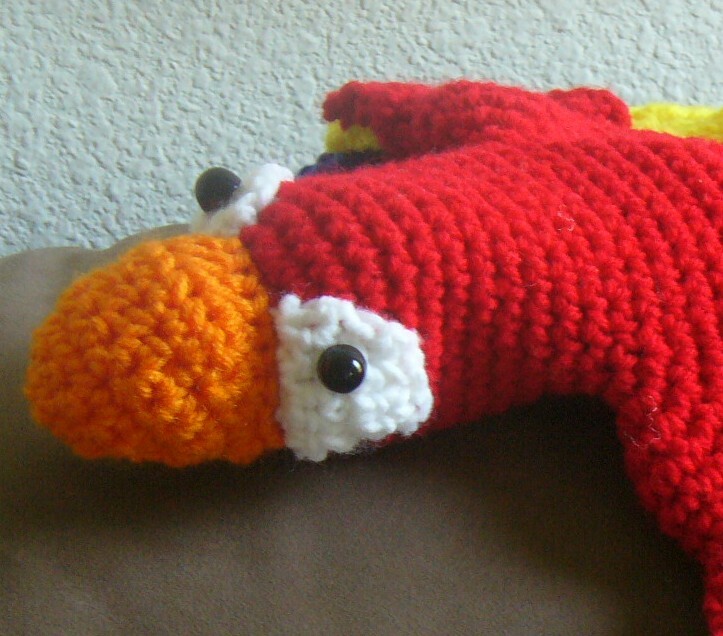 The long feathers and engaging face will make this a favorite with children, but at 13 inches long (not including the tail!) with a 16-inch wingspan, he's big enough for adults to play, too. This is a really fun project to make, but even more fun to use! 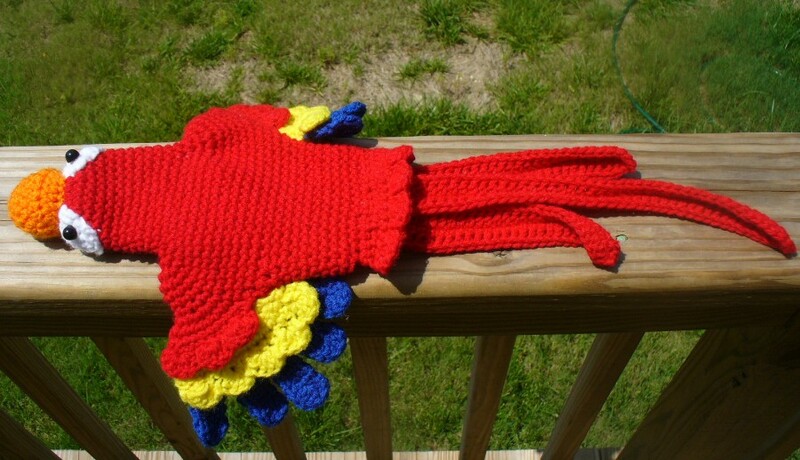 It's sure to be a favorite long after you've completed the last stitch. As always, there are no shipping charges, as the patterns are automatically emailed to you upon payment - please note that orders paid by eCheck will not be delivered until check has cleared. (Pattern requires Adobe Acrobat Reader, which is available for free download at www.adobe.com) Please contact me if you have not received your pattern within 48 hours. Please remember that for sale here is a pattern only, and not a finished product. This is my own original design, and is only authorized for personal use. 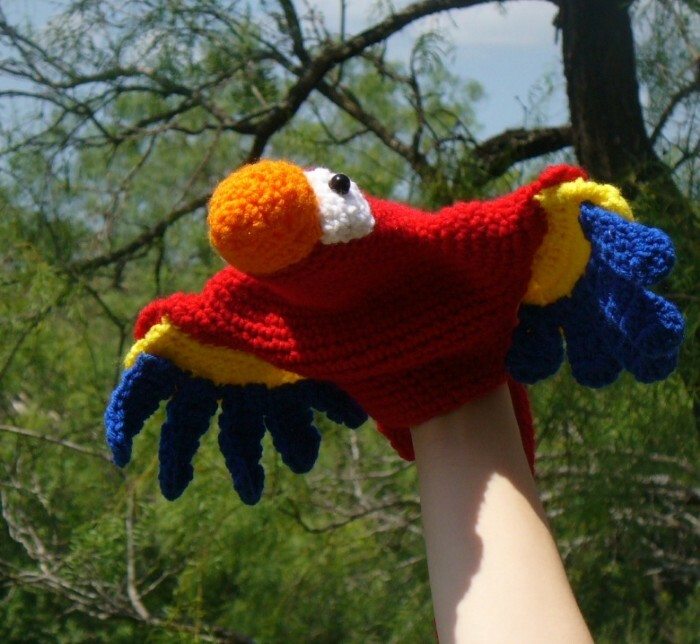 Size: Fits an average adult hand; 13" long (excluding tail), 16" wingspan. Smooth, sturdy worsted weight yarn: 125 yds Red, 17 yds Yellow, 15 yds Blue, 10 yds Orange, small amount White. Sample was made with Red Heart Super Saver. Gauge: 7 sts x 7 rows of sc = 2"